FILE- Tennessee head coach Pat Summitt waves as she leaves the court after Tennessee defeated DePaul, 63-48, in an NCAA tournament second-round women's college basketball game in Rosemont, Illinois, March 19, 2012. Pat Summitt, one of the most successful U.S. college basketball coaches in history, has died at age 64, five years after being diagnosed with early-onset Alzheimer's disease. Her death Tuesday was so significant that it merited a comment from U.S. President Barack Obama. He noted that Summitt, who spent 38 years coaching women's basketball at the University of Tennessee, served as a role model to millions of Americans, including the two Obama daughters. Summitt began playing college basketball in the 1970s, before the United States had laws mandating equal funding for women's school sports similar to men's. So, despite being a talented ballplayer like her three older brothers, she was not eligible for a sports scholarship. She attended a small school in the University of Tennessee system, studying physical education. FILE - Tennessee coach Pat Summitt waits for her players during a timeout in the second half of an NCAA women's college basketball tournament regional final against Baylor in Des Moines, Iowa, March 26, 2012. In 1976, she was co-captain of the U.S. Olympic women's basketball team. That team took the silver medal at the Games in Montreal, losing to the Soviet Union. Eight years later, Summitt became head coach for the U.S. Olympic team for the Games in Los Angeles, where her players won gold. Meanwhile, she remained true to the University of Tennessee at Knoxville, a small city in the mountain foothills of the southeastern United States. Her teams won eight NCAA championships, a record for the division. She is one of very few college basketball coaches to have won more than 1,000 games. Her teams won 1,098. Summit was known for fierce competitiveness, an icy stare when displeased, and an unshakeable loyalty to the young women she coached. She turned down at least two offers from the school to coach the men's team. Summitt is remembered for high standards, even among those who did not play for her. Former UT student Judy Patterson Sichler of Knoxville, Tennessee, remembers seeing Summitt around campus, checking on her players. "She cared immensely for her players on and off the court," Sichler said. "Excelling in classes was a priority — she would prowl the back of lecture halls, drive by dorms, making sure the players were where they were supposed to be when not on the court." 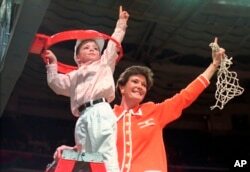 FILE - Tennessee coach Pat Summitt and son, Tyler, take down the net after Tennessee defeated Georgia, 83-65, in the title game at the NCAA women's basketball Final Four at Charlotte Coliseum in Charlotte, North Carolina, March 31, 1996. Her dedication to her job was just as important. Not even the long struggle to have a child (not fully revealed until years later) seemed to get in the way of her work. "I will always remember her coaching while pregnant," said Amy Wainwright of Memphis, Tennessee. "Such a sight. Then watching her son grow up as just a part of the team." In his remarks Tuesday, Obama recounted the oft-told tale of how Summit went into labor while out of the state on a recruiting trip, and demanded that her plane return to Tennessee, rather than make an emergency landing, so her son could be born in her home state. That son, now 25, has become a women's basketball coach. Obama, who awarded Summitt the Presidential Medal of Freedom in 2012, also noted that Summitt's players had a 100 percent graduation rate. 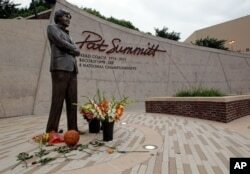 He demonstrated Summitt's dedication to her players by quoting her. 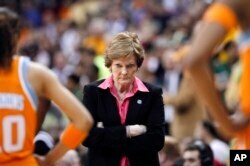 Talking about her record and her players, Summitt had said, "What I see are not the numbers. I see their faces." Summitt announced in 2011 that she had been diagnosed with early-onset Alzheimer's disease. She coached one more season, with reduced duties, before retiring with the title Head Coach Emeritus. She spent her final few months in an upscale retirement home in Knoxville, where a stream of family and friends came to say goodbye. Flowers lay alongside a basketball fans have left at the Pat Summitt statue in Knoxville, Tennessee, June 28, 2016. On the UT campus, a plaza featuring a statue of Summitt has become a place of remembrance, where fans clad in the school colors of orange and white have been stopping by to drop off flowers and pay their respects. The mayor of Knoxville has announced plans for a local bridge to display orange and white lights in tribute to Summitt's legacy. Crystal Franklin Tallent of Dandridge, Tennessee, commented on social media about what she admired about Summitt: "Her players were held to higher standards than any other at UT. You never saw a Lady Vol [the nickname for the women's teams] in trouble for anything. She flew through the glass ceiling and was an inspiration for girls everywhere." While Summitt's son has announced the family will hold a private funeral for his mother, the University of Tennessee is planning a public memorial service for July 14. It will be held in the basketball arena, which seats 21,000 people. It is expected to be full.